WanderMan: When Is A Hitch Not A Hitch...But Still A Hitch? Most RV's have Hitches. I've been using mine for various things lately. Carrying my electric motorcycle, towing a friend's trailer to flea markets to make some extra money for travelling and towing my small hovercraft, It's really nice to have one. Typically RVs are outfitted with a 2" receiver. This is the elongated box shaped section that your hitch goes into. Most of the hitches are ball shaped. Sometimes in various sizes, but similar. But not always. It figures that I would buy a trailer that didn't have a ball hitch at all.Now I had to figure out what I had and what was needed to setup my RV to tow it safely. Simpler said, than done! The military doesn't use ball style hitches for much of anything heavy duty. 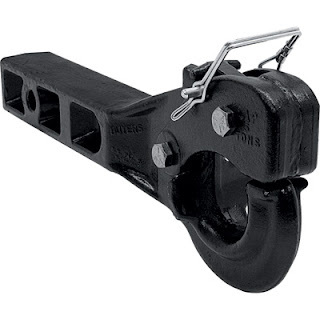 They use something called a Pintle Hook. This goes together with the trailer mounted Lunette Eye. It's a hitch...it's very strong, can perform some nifty tricks, but sure isn't all that common in the RV world. Of course, I had to have one to pick up something I bought as military surplus. A trailer is a trailer, right? Wrong. As I would discover, you need some very specialized towing gear to pull one of these military trailers. Not to mention some interesting trailer wiring adapters! It's definitely a do-able thing, but I am sure glad I did all the research and ordered all the correct parts before I tried it! Saved me a LOT of grief. Way Higher Than A Ball Hitch! 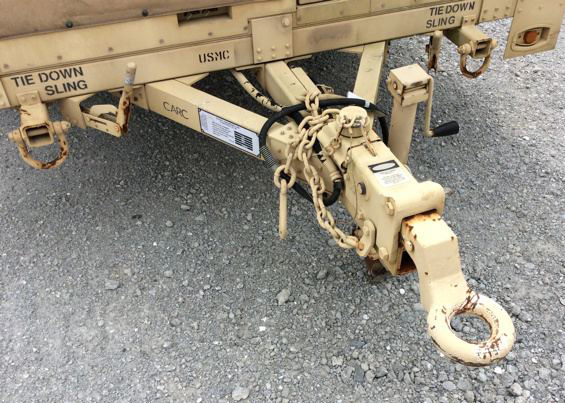 The Military, on the HMMWV (Hummer), mounts the hitch to the bumper with 5 bolts. It's much higher than a traditional ball hitch. In fact those usually hang lower than the 2" receiver itself. Thankfully, it wasn't all that difficult to find a 2" receiver hitch adapter. The one I located and bought sticks straight out from the receiver. It's OK for many applications and it's rating is an incredible 2000 lbs on the tongue and 10,000 lb tow load! Wow!! The trailer I am picking up only weighs 4235 lbs and has a 290 lb tongue weight. No sweat! Well, maybe. Seems that the height may become an issue. If the nose of the trailer is attached too low or too high it could cause some major handling problems. Now what? Well, after some research online it seems that you can buy a 2" hitch extension that will also raise or drop the 2" receiver hole by up to 10". I did notice that the higher (or lower) you go, the lower the towing weight capacity. At 10" it was down to 3500 lbs from 10,000 lbs! Obviously, that wasn't a good thing. I went back and measured the actual rise I needed to get the trailer mostly level and it turned out to be around 6" of rise. At that height I was still well over 5000 lbs tow rating so it would work! Looking around I managed to find one for about 50 dollars with free shipping. Keep in mind these things are heavy! Shipping could cost a sizable chunk of $$$. Thankfully there are lots of free shipping deals to be had! I'm not sure how many of you will ever need a Pintle style hitch, but they are out there along with 5th wheel, goose-neck and ball hitches. 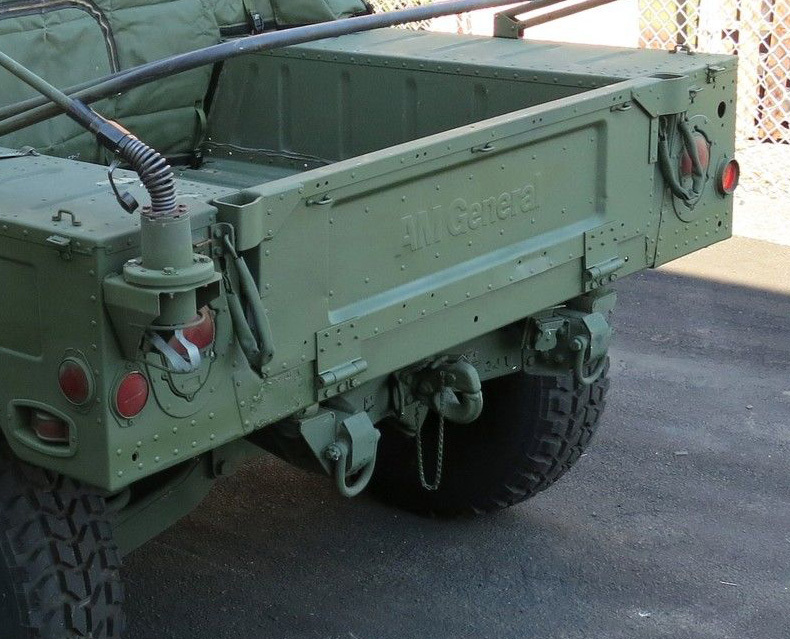 I now have the ability to buy military surplus (mounted on trailers) and pick them up during my travels. Who knows, maybe that's a new business model. Or maybe just a good excuse to travel! And Happy New Year! !